Pink Zebra and a Giveaway! Good evening everyone! Super excited to celebrate tonight that in just over a month I have already over 50 followers via Bloglovin and 33 followers via email! Thank you guys so much for the love! Tonight I am celebrating by doing my first non polish review and doing a complete polish lover giveaway. First for the review…. About two weeks ago I was contacted by Shannon, a sales consultant, about reviewing some Pink Zebra products. 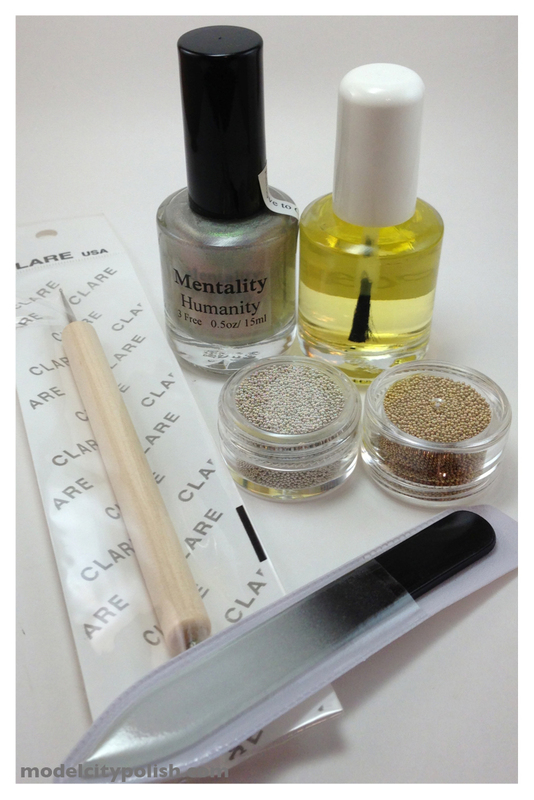 She let me brows her site and pick a few goodies to share with you guys. Now I personally had not heard of Pink Zebra but as soon as I looked at her sales page I was super excited! Pink Zebra is kinda like Scentsy (I am sure we have all seen their stuff by now) but in my opinion better and I’ll share you why. 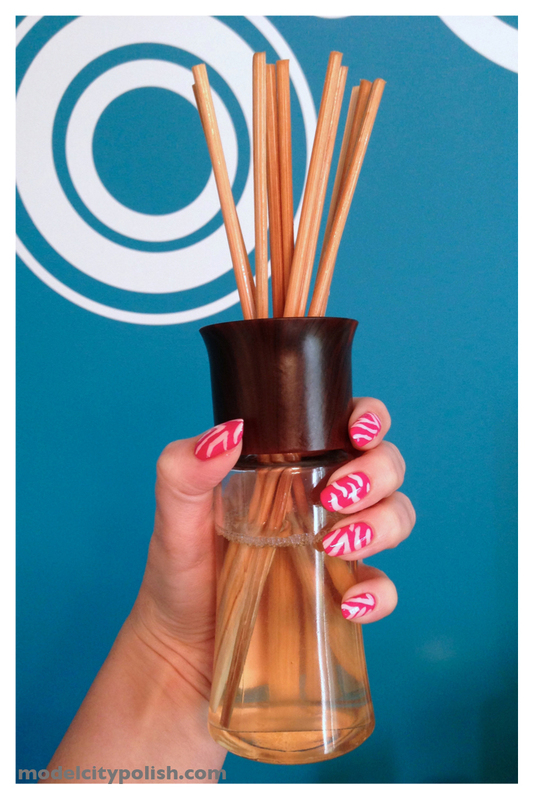 First I would like to talk about their Re-Sealable Reed Diffuser. You heard me right, re-sealable. That alone is pretty awesome because you can cap it if your going to be away for a period of time and not waste it! The packaging is pretty cute and simple. I picked the Orange Dreamsicle scent and loved it. It’s more of a softer smell and not overpowering. I have been using this for a week now in the guest restroom and have really enjoyed it. 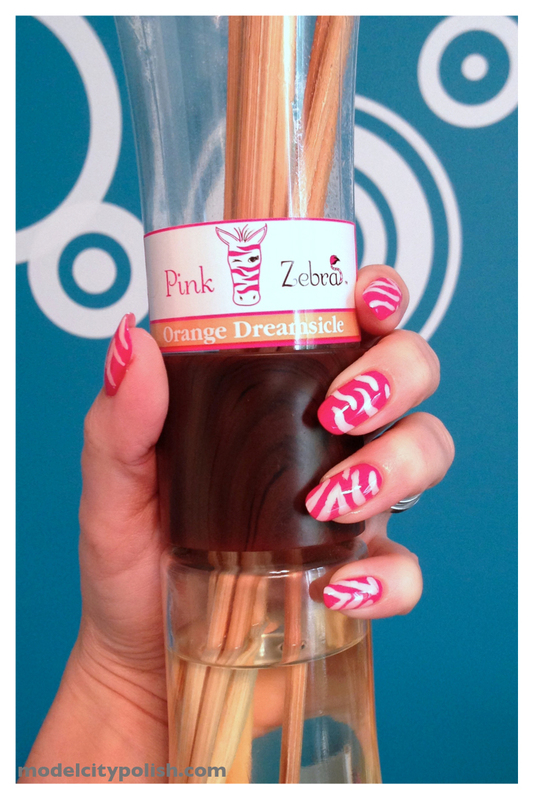 Now for the normally terrible part about a reed diffuser that Pink Zebra has fixed……. Since the cap is resealable you can cap it, turn it upside down to soak the reeds, and then turn back over and uncap. No drippy oils everywhere! I love this idea and am totally sold! 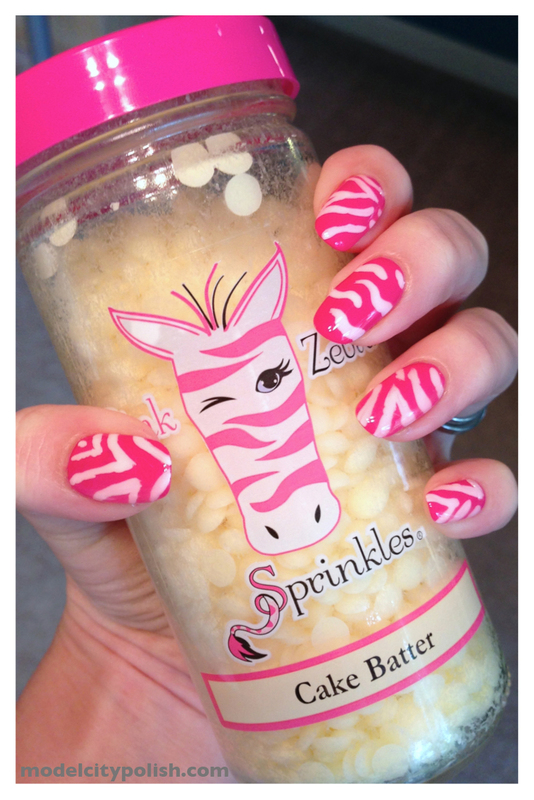 Now of course I had to do some cute pink zebra nails to go with tonights post. I used Julep Raegan, Carol, and Finger Paints Paper Mache. For my first time I think they turned out okay. Now for the wax. I picked the Cake Batter scent because who doesn’t love the smell of baked goods! The smell was really nice and I would compare it to the birthday cake scent by Yankee Candles. Now first of all the little pieces are super cute and are stored in a really nice heavy glass jar. I love how these are super multi purpose. First up you can use it in a warmer. 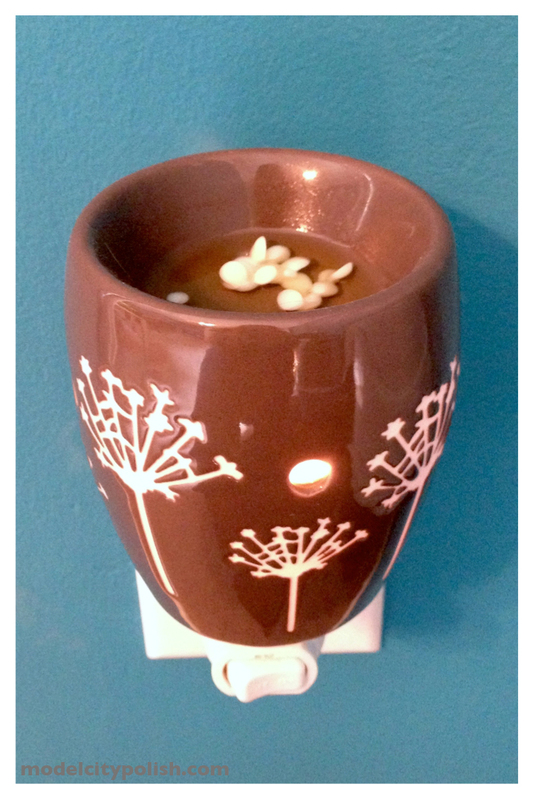 I have tons of Scentsy warms so I was able to reuse them with this product. The nice part about the sprinkles compared to other warmer waxes is you can control the scent better with these. If you just want a light smell just add a few pieces and if you want a stronger smell add more. Now here is my favorite part about the sprinkles. 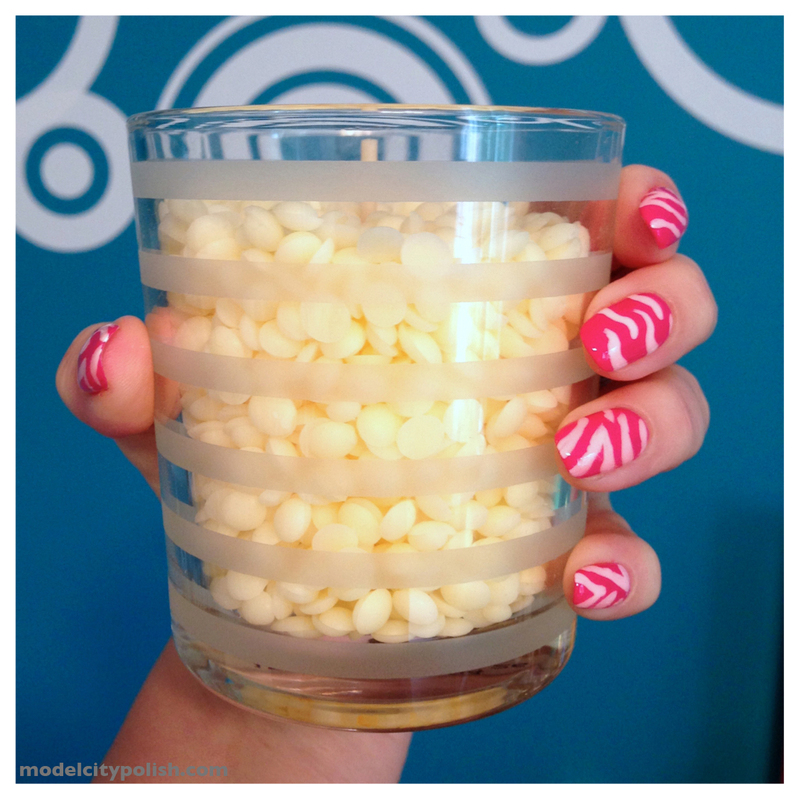 Last minute company is coming over and you want to set the mood with some pretty candles, use your sprinkles! 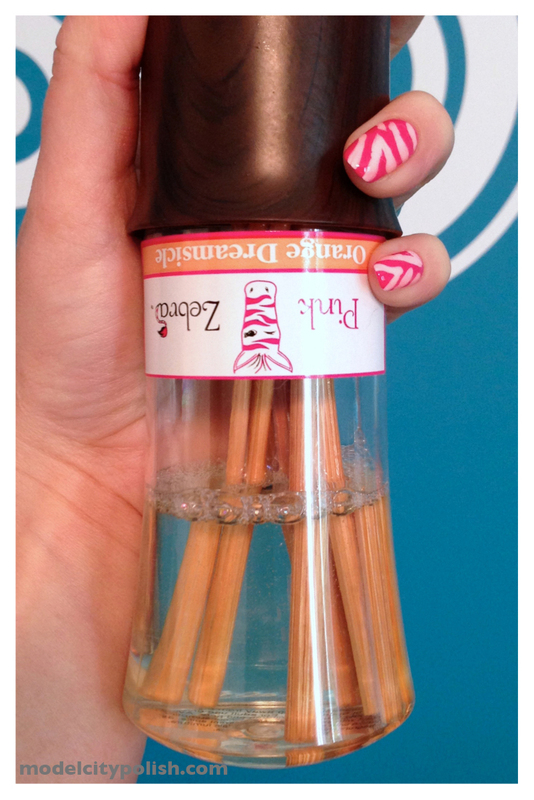 You can also buy super cute jars and wicks from Pink Zebra to make your own candles. Now I only got the one scent but you could buy different flavors to create a colorful, fun candle. I used one of my old candle jars to show you guys how cute these things are. My jar was a little wide because when I burned the candle it burned mostly in the center and left the outside sprinkles untouched. Not all bad because the came out super easy and I was able to put in the warmer, yeah!